Will New Zealand still be willing to pursue its recent trade overtures to Iran, now that US President Donald Trump has used his speech in Riyadh to single out Iran as the main source of terrorism and instability in the Middle East? Trump did so only hours after a moderate was re-elected in a landslide in Iran’s elections, a victory that opened up a potential for dialogue that the US has chosen to spurn instead, utterly. Trump’s unblinking hostility will only strengthen the hand of the conservatives in Teheran, who’ve always felt that trying to pursue any compromise policy with the bellicose Americans was a complete waste of time. During the 1980s, Iran was one of New Zealand’s top five export markets. As recently as 2014, our commodity exports to Iran were worth $NZ163 million. The lifting of sanctions against Iran in February 2016 – under an agreement whereby Iran would curtail its nuclear programme – has seen New Zealand eagerly try to pursue massive trade opportunities in meat, kiwifruit and education. Now, these potential economic gains to New Zealand will have to weighed against being seen in Washington as trading with and abetting Trump’s arch enemy. This morning’s Trump speech demonized Iran as the main source of terrorism and instability in the Middle East. In its entirety, the speech is available here. …No discussion of stamping out this threat [of terrorism] would be complete without mentioning the government that gives terrorists all three — safe harbor, financial backing, and the social standing needed for recruitment. It is a regime that is responsible for so much instability in that region. I am speaking, of course, of Iran. From Lebanon to Iraq to Yemen, Iran funds arms and trains terrorists, militias, and other extremist groups that spread destruction and chaos across the region. For decades, Iran has fuelled the fires of sectarian conflict and terror. It is a government that speaks openly of mass murder, vowing the destruction of Israel, death to America, and ruin for many leaders and nations in this very room. Among Iran’s most tragic and destabilizing interventions, you’ve seen it in Syria. Bolstered by Iran, Assad has committed unspeakable crimes, and the United States has taken firm action in response to the use of banned chemical weapons by the Assad regime, launching 59 missiles at the Syrian air base from where that murderous attack originated. Responsible nations must work together to end the humanitarian crisis in Syria, eradicate ISIS, and restore stability to the region and as quickly as possible…… Until the Iranian regime is willing to be a partner for peace, all nations of conscience must work together to isolate it, deny it, funding for terrorism, cannot do it, and pray for the day when the Iranian people have the just and righteous government they so richly deserve. Right. No mention of the Saudi/Israeli/Jordanian interventions, and their attempts to confront Iran by taking out its Syrian ally. 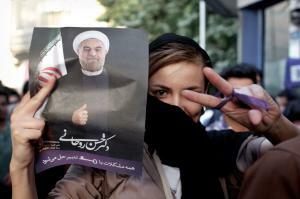 Certainly, the regime in Teheran – or at least its conservative wing – is reprehensible. But Trump is dialling US policy back by decades, to the days when the US and Israel, the corrupt Saudi regime, and the authoritarian dictators of Egpyt and Turkey were its prime allies and military surrogates – and everyone else who resists their dominance of the region is the enemy. Presumably, Trump is soon going to tear up the nuclear agreement whereby Iran was on course to rejoin the modern world. In fact, the main country that “funds arms and trains terrorists, militias, and other extremist groups that spread destruction and chaos across the region” has been the kingdom of Saudi Arabia – which created and funded Islamic State, funded Osama Bin Laden, and provided the vast bulk of the 9/11 terrorists. Apparently, that point now needs to be remade. Because business as usual is being resumed. On his current trip, Trump has finalised a $55 billion string of business deals in oil, gas and manufacturing with the Saudi kingdom, as well as clinching a $US109 billion military deal with the House of Saud. No wonder our new Foreign Minister Gerry Brownless has begun to back-pedal on his predecessor’s sponsorship of the recent UN resolution on Israel and Palestine. Similarly, we can expect Brownlee to quickly and dutifully reflect the tough new US line on Iran. And where will that leave the corporates who went on that ministerial-led delegation in December to look for export openings in Iran? You’re always going to have to let Trump appear to be the winner when you meet with him, but if you’re willing to stroke his ego, you’ll get what you want. That’s what companies are learning. And taking advantage of. As mentioned, that could make our trade with Iran a diplomatic sore point. It also signals how this government should proceed on the TPP, if it still truly wants this sorry deal in its current shrunken form. Right now, Trump’s priority is the rewrite of NAFTA. If Canada and Mexico really want the TPP – and it is a problematic deal for both countries – they will need (a) to get NAFTA to look more like the TPP and (b) get Trump to think he’s the author of the provisions that directly benefit US corporates. If Trump can be convinced that he authored the provisions that Canada and Mexico have carted over from the TPP into the NAFTA rewrite, he might be induced to look more kindly on the TPP itself, come 2018. For that reason, it would be advisable for TPP advocates to go quiet on the TPP, and let the NAFTA rewrite be the immediate channel on trade policy. If Chris Cornell did indeed commit suicide, then the extra tablets of Ativan he reportedly took after the last Soundgarden show in Detroit seem to have been the immediate trigger. (His wife’s concerns were alerted by his slurred speech on the phone, after the show.) Ativan is an anti-depressant from the benzodiazepine family and has a lengthy track record of occasional nasty side effects, and what the medical profession delicately calls ‘anomalous’ reactions. Because what happened was that I decided that it was a drinking problem, that I was an alcoholic. And I went to several doctors who confirmed that. So I stopped drinking, and I spent five days in a clinic, initially. A lot of hypnotherapy, individual therapy with various people. But I carried on with the drug thing a little bit. And then I realized that both things were really affecting me, that in order to assist me gettin’ off alcohol, I had used a lot of tranquilizers. One in particular: a drug called Ativan, which is of the Librium-Valium variety. And I became addicted to it. So in January, I went to Meg Patterson [the doctor who championed a famous ‘black box’ treatment for addiction] in California; she’d helped Eric Clapton get off heroin. And she said that Ativan is more addictive than heroin. That this could be my fate? And finally this version of Prince’s “Nothing Compares 2U” is a showcase for Cornell’s voice. While he had all the vocal power in Christendom at his disposal, he doesn’t bellow this song. This is a beautifully measured interpretation, and a reminder of what’s been lost.